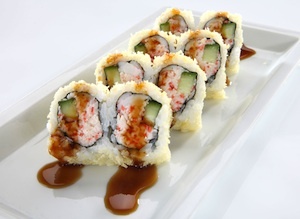 What’s your favorite roll? My favorites are ones that are spicy and crunchy. Words like “sriracha” and “tempura flakes” jump out at me when I’m perusing a sushi menu at a restaurant. I spoke with several Baltimore chefs and restaurant managers at Waterfront Kitchen, RA Sushi and For the Love of Food to get their tips on how to make sushi rolls at home. Obviously, you need the freshest possible fish. Using perfectly fluffy, sticky rice is also critical. Read more here at Chesapeake Home and Living. I'm a Maryland (sub) urbanite who loves food, art and travel. This entry was posted in Food & drink and tagged baltimore, chesapeake home and living, fish, for the love of food, julekha dash, ra sushi, sushi, sushi roll, waterfront kitchen. Bookmark the permalink.